Following an emergency meeting at Dirk Towers, the time has come … to create a The GROGNARD files fanzine. Last week, I ran on of those infernal twitter polls in a fit of beer fuelled excitement in a bid to understand if there was interest out there. 41 people voted to say that they would read a fanzine … so we’ve agreed to do one as a PDF and as a hard copy (if we can generate enough funds to support it). To help to create something interesting and collectable we have launched a Patreon campaign. If you want to throw some pennies in the hat to support our endeavour, then we’ll be very grateful. We are offering various goals, that you’ll see on the link, the first is a PDF ‘zine, but what we’d really want to do is to produce a real ‘zine with ink, paper and staples. It will have a flavour of the old school ‘zines, even their distinctive smell. If you have been following my twitter feed on @theGROGNARDfile over the past few days you will have seen that I have taken delivery of a bundle of IMAGINE magazines. TSR UK published IMAGINE magazine from 1983 – 1985 with Don Turnbull at the helm and Paul Cockburn as the assistant editor. I used to subscribe to it back in the day, despite it’s coverage of AD&D, a game that I didn’t Games Master and only played occasionally. It was an interesting companion piece to White Dwarf as it struck a very different tone to the Games Workshop magazine. Dare I say it, but on reflection, the resources it provided were of a superior quality. PELINORE, its collectable game world, was notable for it’s richness and wonderful maps that could spark a hundred scenarios without really trying. It lacked the general consistency of White Dwarf, for every Pelinore supplement there was a weak and confusing scenario or waffely article about the minutiae of nothing in particular. In the podcast I have described White Dwarf as a kind of analogue social media – connecting our experience of role-playing with the wider community. White Dwarf did this tacitly through its small ads and letters page, Imagine on the other hand, was more explicit in its support of the fan culture. In the back pages there was a regular ‘zine section and in later issues a series of articles entitled FANSCENE which was an attempt to reach out and encourage gamers to become more active participants in the hobby. 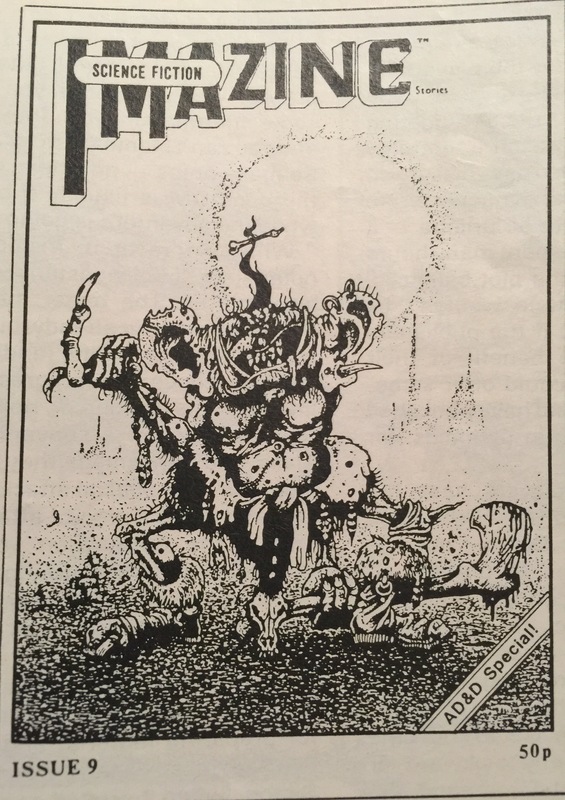 In the mid-80s, there was something of a boom in the world of RPG ‘zines. Many of the second generation RPGers had gone to college, so applied all of their new found freedom to knocking out these little magazines. I lost all of my fanzine collection in The Great Clear-out of ’92 when it contributed to landfill. They’re building on it now. Under the foundation of those closely-packed semi-detached houses, there will be the remnants of DRAGONLORDS, LANKHMAR STAR DAILY, DAGON, and IMAZINE. Unlike other artefacts from RPG’s past, it’s extremely difficult to recover those lost ‘zines as they rarely appear for sale on the internet. Not surprising, given the extremely low print runs. All that remains is the distant memory of their content, which was irreverent, packed with ‘in’ jokes and references, quirky scenarios and pitch-battles between readers who were arguing over the latest controversial issue affecting the world of gaming. I enjoyed that sense of a conversation going on, even if I didn’t get all the references. I have ‘zine’s in my blood. At the time, I was active on the PBM scene and had a ‘zine newsletter of my own ‘THE NATIONAL KOBOLD’ (my life in PBMs will be covered in future Podcasts). I was also contributing to ‘zine’s too, notably DRUNE KROLL where I began a BROOKSIDE RPG PBM (no takers, pity because my Damon Grant whodunnit scenario was brilliant). In the early ’90s I created an anthology of Science Fiction stories in a collection titled THE PSEUDO-NYMPH, notable for it’s wonderful illustrations. In the mid-to-late 90’s Blythy and I edited PROP, a small press, literary magazine for 10 issues (really!). We are both excited at the prospect of producing a ‘zine because it will allow us to explore avenues that are impossible in the podcast. We plan to include some of the usual features, but with additional ideas, that we’ll preview here over the coming months. You can have your very own cut out and keep ridiculous shrine to Caroline Munro. Chuck a few coins in the beret and make it real. Hi Dirk, I’ve been really enjoying the podcast which has by coincidence started at the same time as I’ve started role playing for the first time in more years than I’d like to think about (we’re playing the Hellfrost setting for Savage Worlds). I’ve bunged you some money for the fanzine – apologies for the minimum amount but there’s a very good chance I’ll be made redundant in the next few months so I can’t justify spending more at the moment. I am really looking forward to reading it though. I have a question about the format – would it be possible to release it in an epub or html format as well as the pdf? Or alternatively single column version of the pdf. I find pdfs hard to read on any of my various electronic devices. It’s annoying that electronic versions of rpg rules are all pdf even though they have become the format that I buy games in now due to no more space in my house for anymore games (just because I haven’t been playing doesn’t mean I had to stop buying does it?). Thanks again for the marvellous podcast – I’m looking forward to the one on Stormbringer and also the fanzine :-). Thank you very much for the kind words of encouragement regarding the Podcast. It’s great to know that it is resonating with you and your experience of playing. I am tempted to explore Savage Worlds, but there’s so little time. Thank you very much for being one of the founder members of the Patreon campaign. Feel free to stop at any time, I would hate to think that you are putting your self in any financial difficulty given your present circumstances. I hope that everything works out for you. As for the different formats, I’ll give it some thought, I want to maintain the old school, home-made feel. There’s unlikely to be reams and reams of text to read. It will probably be laconic, snappy and visually interesting. I don’t know yet. Thanks again for your kind words about the podcast. It means a lot to us all! love old zines.. I collect them..
Do you have list of your collection? How do you track them down? That is *some* collection. Amazing. I’d love to track down Dragonlords, as I used to be a bit obsessed with it back in the day, I wonder what I’d make of it now! Would you be interested in being a contributor to our fanzine? It would be good to have an overview of the scene, with some examples? Let me know and I’ll get in touch with the details. Thanks for sharing. Then there was also Dimension Zero, a short-lived zine from the mail order RS Games, to which I contributed one or two articles. Ahh, the folly of youth. The 80s / 90s RPG zines were hugely enjoyable, if only for their wild ambition and idiosyncrasy. Shame they’re not more easily available these days. There was something of a DTP explosion the early 90s which allowed ‘zines to become very slickly produced. There was a real appetite for interesting material generally – SF stories, games ‘zines, radical thinking – but the bloody internet turned up and destroyed it all. People are mourning for Woollies, DIxons and HMV, but what about the ‘zines man? What about the ‘zines? Recorded your bit of the podcast tonight. You have surpassed yourself, it’s excellent … although I did keep tripping up over “drip-feed” for some reason. Feels very reverential this part of the episode. Blythy and I will need to lighten up a bit for the next part! Thank you! Are you still planning on doing a follow-up episode on Moorcock’s influence on RPGs? We are going to do a section about Moorcock for the second episode. It’s going to be a ‘show and tell’ where we’ll share something interesting from our Moorcock collections and talk about it for a bit and how it may be used in a game. Each episode has been the same, I start off the process worrying that there isn’t enough material, by this point I’ve overwhelmed by everything and think that I need more time. I have a box full of old fanzines up in my parents’ loft. I was involved with Demon’s Drawl right from the beginning and up until it “converted” to Telegraph Road. Not sure exactly what’s in the box but next time I’m over (I live in Spain now) I will have a look…. I love zines and especially the very amateur type! Totally DIY! Take a look at Back to the Dungeon RPG! The entire RPG and all my modules are all in Zine Style!